It’s not your grandmother’s table setting, that’s for sure. But the images of vintage flatware, antique china, and heirloom trinkets are what make Jennifer Slattery’s home textiles so special. Jennifer is inspired by traditional Irish table settings, and she’s skilled in modern graphic design and printing techniques. The combination is truly original. After we saw Jennifer’s work on a scouting trip to Ireland, she created a custom table runner for the Daily Grommet community that combines two of her signature techniques: line drawings embroidered on Irish linen, and digitally printed photos appliqued on Irish linen. 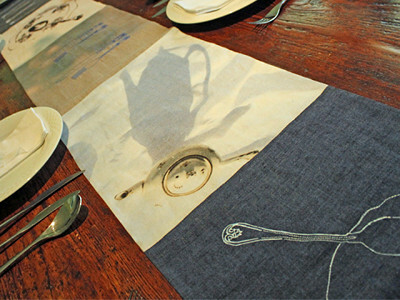 The embroidered line drawings are of cutlery that belonged to Jennifer’s grandmother. The photo-generated sections feature a tea party scene. The teapot (also from her grandmother) was casting long shadows when Jennifer captured the pictures in the late afternoon sun. The result was a trompe l'oeil effect where her runners come to life. Sewn together, the blending of nostalgia and modernity is a perfect way to add some personality and whimsy to your tabletop. Do you make other items besides the table runners? I would like to know more about your linens. Do you have a catalog? @ Maggie - Jennifer does make other items. With talent like hers she wouldn't be able to contain herself to just one product. We chose this exquisite table runner to import. I can send you more information directly about other items. @ Maggie Hi Maggie, thanks for your comment! I do make other textile products - napkins and placemats, cushions and throws too, I also upholster antique chairs with my fabrics. 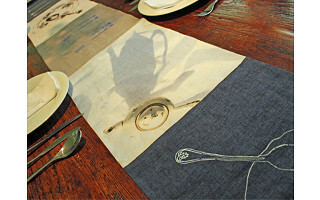 The piece I have created for Daily Grommet is a combination of all of my table linen collections - combining my printed work that features photographs of my grandmothers plates & cutlery, and my embroidered Irish Linen work featuring line drawings of my grandmothers cutlery - the drawings are embroidered on to Irish Linen - I have napkins & placemats to match all of the collections featured. What a lovely tribute to your grandmother and your family history. @ Amy thanks Amy, I think she would be delighted! These are lovely. What are the dimensions? @ Judy the large is 92" x 12” and the medium is 72" x 12”. I wish to congratulate Daily Grommet for spot- lighting your unique design thinking and innovation. Let your ' family history' and 'Granny Chic ' creativity continue to blossom with further artistic delights. @ Alan Ryan Thanks for the kind words Alan. We have a serious soft spot for craft and any modern interpretations of traditional techniques. That pretty much sums up Jennifer's work, no? @Ena Ronayne: So wonderful of you to stop by for a chat, all the way from Dublin :0) Our co-founders, Jules Pieri & Joanne Domeniconi, were in Ireland in January, honored to be hosted for their travels by Enterprise Ireland, the government-funded business development organization. They were hoping Jules & Joanne would discover some Irish products to launch to the US market. And that's how Jennifer Slattery's distinctive table runner debut as a Grommet. You can read more of Jules & Joanne's Grommet hunting in Dublin here. Our Customer Support Team will be in touch with you re: buying Jennifer's linen in Ireland. I'm new to Daily Grommet and I love the large table runner - will it be back in stock or have I missed out? @ Cathy Fuller: Welcome! The Large runners are sold out. Hope the Medium ones can work. It’s not your grandmother’s table setting, that’s for sure. But the images of vintage flatware, antique china, and heirloom trinkets are what make Jennifer Slattery’s home textiles so special. Jennifer is inspired by traditional Irish table settings, and she’s skilled in modern graphic design and printing techniques. The combination is truly original. After we saw Jennifer’s work on a scouting trip to Ireland, she created a custom table runner for the Daily Grommet community that combines two of her signature techniques: line drawings embroidered on Irish linen, and digitally printed photos appliqued on Irish linen.